It’s going to be a quick one to review this because, in all honesty, it takes seconds to turn on and get going. Let’s face it, WiFi isn’t always good enough. Sky TV have launched their new Sky Q system and, in order to try and solve the home WiFi coverage problem, they’ve made each box a WiFi hotspot. For other providers, you’re going to end up with a box in the corner of your house – usually where your cable TV or BT line comes in, and that’s expected to cover your entire home. It’s not the best position for it, but that’s where the cable comes in and that’s usually where it stays. 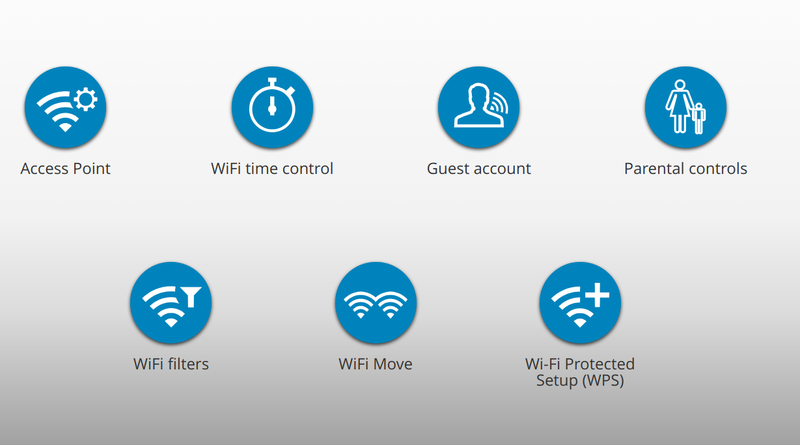 Most WiFi routers will provide coverage round but not necessarily in the direction you want it to “point”. The signal can also get dampened by walls and other structures, which block the signal somewhat. 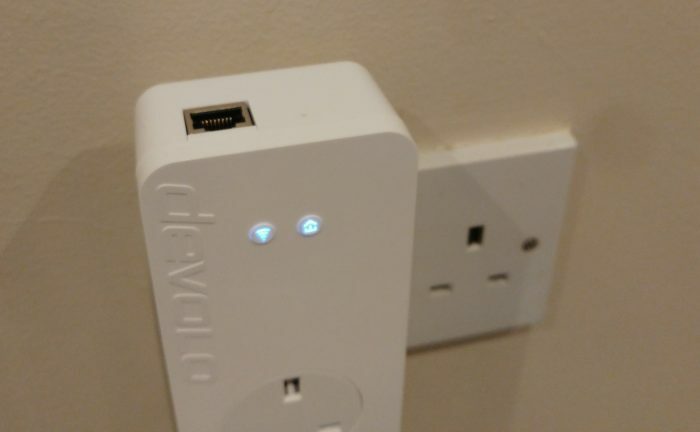 Here Devolo give you two plug-in gadgets which won’t clutter up a socket as they’re pass-through. The setup is ridiculously simple. 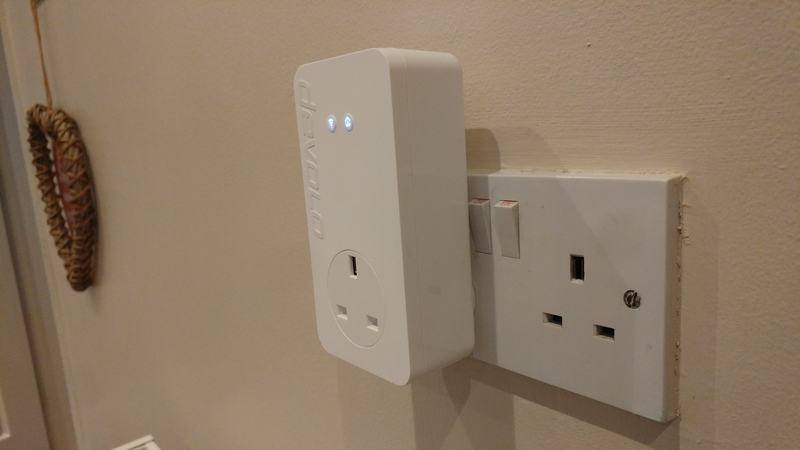 You unbox and plug in the 550+ duo+ adapter into a power socket near your router. There’s a supplied ethernet cable which you just plug into the router (which is in my garage as you can see) in it. Here’s the main unit, with the feed from the router plugged in at the top. Next step? Just get the other part, which is the WiFi adapter (it’s a dLan 550+ WiFi), and put it near to where you want the signal to be. There’s a wireless key on the back which you’ll just need to make a note of before you plug it in too. As a rule of thumb you’ll need to put it on the edge of your existing WiFi coverage. For me that was the centre of the house. Once you plug it in it’ll start to boot, and after about a minute you just need to press the “Home” button and then run back to the other unit (the 550+ duo+ adapter that is plugged into your router) and press a small data encryption button on the side. That, I have to say, is it. 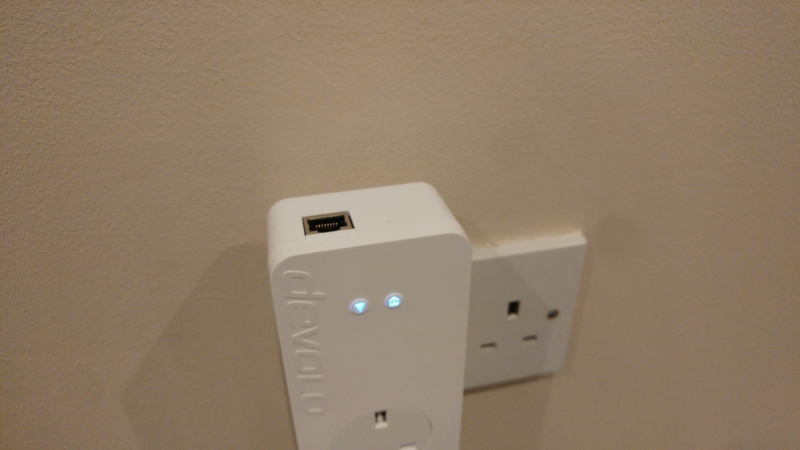 To connect you’ll just need to pop in the name of the access point (it’ll be “devolo-####”) WiFi key and – boom – you’re connected. It’s as simple as that. Setting it up like this means that you’ll get a second WiFi access point. 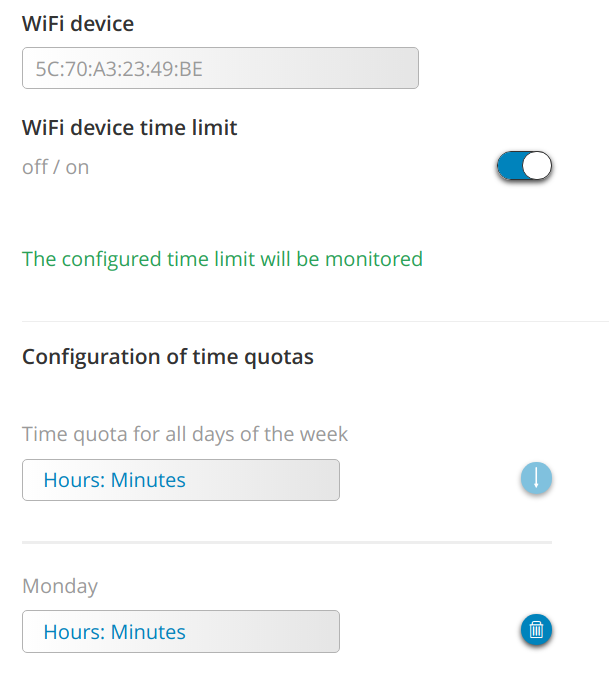 You can use the Devolo app to monitor your home network too. Another method of setup is to clone your existing WiFi. This may be more advisable to those who want to just remember one access point name and password. To do this you’ll need to do pretty much the same process. Hook the main unit (which has two ethernet ports so that you can pass through the ethernet port too) into your router, plug the other unit in and press that “Home” button again, but this time you need to press the WPS key on your router. This will then cause the second adapter to grab your WiFi details and you’re done. It’ll then boost out your existing signal. Top banana. The good thing? The actual WiFi unit also has an ethernet output, so good if you have a TV box or something else which doesn’t “do” WiFi. Plug it straight in. 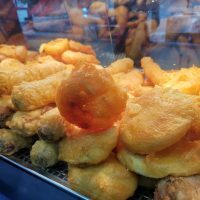 The bad things? Well, despite the claims of speed on this, I got 2.4GHz WiFi and 100MBps ethernet ports on this equipment. Whilst that keeps cost down, it means that a Virgin Fibre connection hitting your house at 300Mbps is suddenly going to slow down to roughly 50Mbps on your 2.4GHz WiFi. That said, it’s a very quick and easy way to boost your WiFi reception. The setup was so easy and painless. You can dive in further. 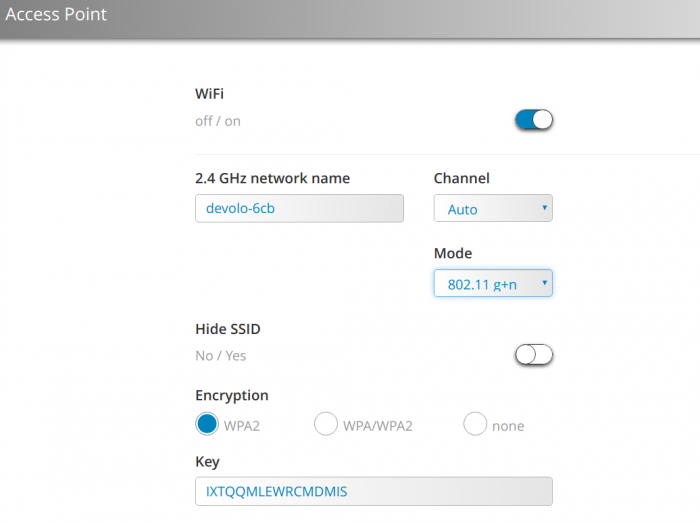 Just browse to the IP address of your first devolo adapter and you’ll have a plethora of options which let you adjust your access point name, password and you can even set time restrictions for each device on your WiFi network. Ideal for kids who’ve got mobile devices in the house. 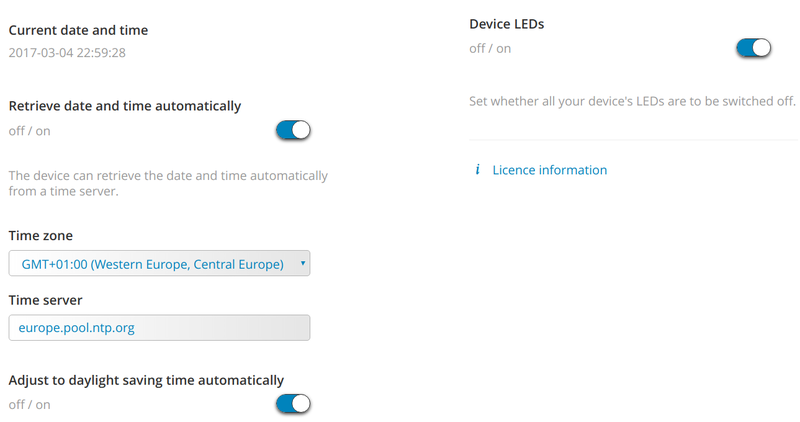 It’s all pretty self-explanatory and you don’t really need a manual, but you can switch on the parental controls here and also set allowed times for each device on the screen below.. The time will be updated from the internet and, if those front LED’s are getting on your nerves, you can even turn those off too..
You can also keep the device up to date and save or restore the config for later use, just in case you lose it. This entire solution worked very well, but despite the “up to 500Mbps via powerline” and “300 Mbps wireless” speed claims, the 100Mbps port input isn’t as fast as the 650+ version, which is perhaps more suited to cable fibre connections which have the potential of feeding more than 100Mbps into your home. 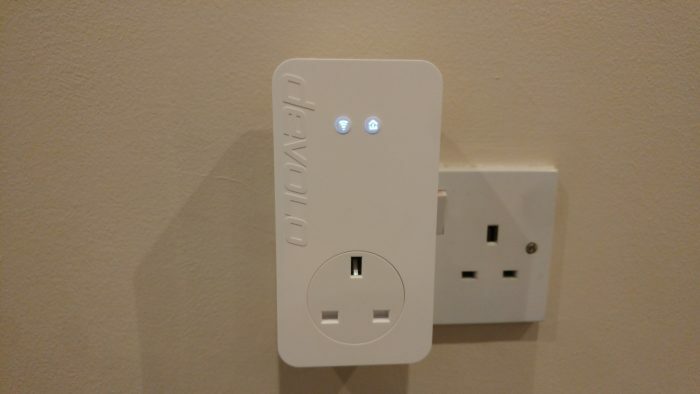 Put simply, if you’ve got a broadband connection which is less than 100Mbps and you’re suffering from WiFi coverage problems, this magical solution will sort it. If, however, you’ve got a broadband connection of more than 100Mbps, maybe look for the dLan 650+ Powerline or something similar. 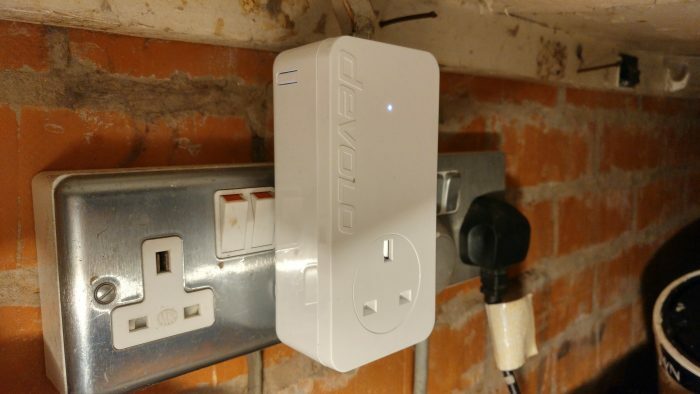 The dLan 550+ WiFi is £109.99 from the Devolo website. It offers a range of up to 400 metres and, as you’ll have seen before, it integrates a “Wi-Fi Move” technology which means that your devices automatically connect to the strongest Wi-Fi access point. An ultra-fast way to boost your coverage or fix not-spots in your home. 2.4GHz only though, and super-fast broadband owners might want something more. MWC - The Sony Xperia XA1 and XA1 Ultra. Up close.